St. John’s harbour. 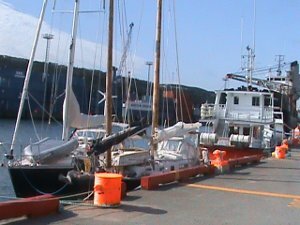 Seaquester, a boat from New England, rafted alongside. In my first serious sea trial, sailing 500 miles from Prince Edward Island to St John’s Newfoundland, a number of issues came up which I have been giving my attention to the past few days. The main issue was the flexing of the main mast – both above and below the partners. When sailing to wind in a chop the mast would flex creating a disconcerting creak in the partners and an unnerving movement of the mast below decks. I realise now that the long bury of the main mast (8 feet) requires more girth below the partner and/or a more deep partner. In essence we need a new formula for mast and partner contruction that takes into account bury length. The foremast with considerably less bury experienced no flex or creaking. 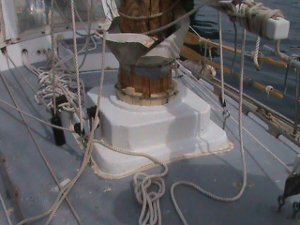 As a solution, I have built an addition to the mainmast partner and spent considerable time custom shaping each new wedge so it conforms the roundness of the mast and partner and provides a very snug fit all around. The depth of the partner has been doubled from 4.25 inches to 8.5 inches. The addition was built using six cut half rounds of quality spruce planks all through bolted with 4 half inch galvanized carriage bolts and then the whole construction glassed over. See the pictures for the during construction and finished design. Another issue was main sheet blocks being too close and causing chaffing or even jamming of the sheet line. I am repositioning the blocks to remedy this problem. 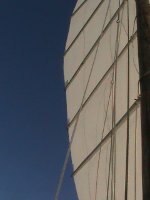 I noticed that the main sail developed much more twist than the foresail which had almost no twist at all. 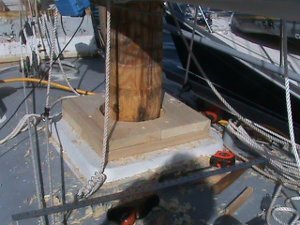 The only difference is that the foresail is sheeted ‘first pull from the bottom sheet span block’ whereas the main is sheeted ‘first pull from the top’. I will sheet the main identically to the foresail and see if this results in some improvement. 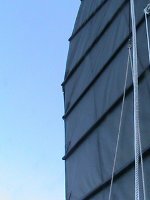 Two issues with the sheet spans – more with the mainsail than the foresail. First chaffing. The quarter inch braided nylon I used showed excessive chaffing and required changing in the two top spans. This is partly due to the block attachment. The other issue was the sheet span and sheet lines getting twisted. I not sure what was causing this and I would drop the sail, re-hoist and the twist would be gone. But with an hour of two they would be back. I’m installing small double swivel shackles for the main sheet spans. This should eliminate twist as well as reduce chaffing. I’m also replacing the sheet spans with duel polypropylene. One slightly slack to act as a backup if the the working one chaffs through in the middle of the night. I also believe polypropylene to have higher resistance to chaff. My next sea trial, St John’s to Cork, approx. 1800 miles, will test out my changes and I’ll report back then. I will be leaving on 13 to 15 August. The last time it took me 17 days. So talk to you again early September. This entry was posted in junk rig, junk rig design, junk sail, masts and tagged junkrig, mast partner, sail twist, st johns. Bookmark the permalink. Simon, da iawn! pob lwc gyda’ch fordaith.